30 Oct 2018 Washington, D.C. - Lawrence Berkeley National Laboratory's National Energy Research Scientific Computing (NERSC) Center has signed a contract with Cray for NERSC's next-generation supercomputer, a pre-exascale machine slated to be delivered in 2020. Named "Perlmutter", in honour of Berkeley Lab's Nobel Prize winning astrophysicist Saul Perlmutter, it is the first NERSC system specifically designed to meet the needs of large-scale simulations as well as data analysis from experimental and observational facilities. This new supercomputer has a total contract value of $146 million, including multiple years of service and support, and will more than triple the computational power currently available at NERSC. It represents DOE Office of Science's commitment to extreme-scale science, developing new energy sources, improving energy efficiency, and discovering new materials. In addition, the new system has a number of innovative capabilities that will facilitate analyzing massive data sets from scientific experimental facilities, a growing challenge for scientists across multiple disciplines. "Continued leadership in high performance computing is vital to America's competitiveness, prosperity, and national security", stated U.S. Secretary of Energy Rick Perry. "This advanced new system, created in close partnership with U.S. industry, will give American scientists a powerful new tool of discovery and innovation and will be an important milestone on the road to the coming era of exascale computing." "This agreement maintains U.S. leadership in HPC, both in the technology and in the scientific research that can be accomplished with such powerful systems, which is essential to maintaining economic and intellectual leadership", stated Barbara Helland, Associate Director of the Office of Advanced Scientific Computing Research at DOE Office of Science. "This agreement is a step forward in preparing the Office of Science user community for the kinds of computing systems we expect to see in the exascale era." "I'm delighted to hear that the next supercomputer will be especially capable of handling large and complex data analysis. So it's a great honor to learn that this system will be called Perlmutter", Dr. Perlmutter stated. "Though I also realize I feel some trepidation since we all know what it's like to be frustrated with our computers, and I hope no one will hold it against me after a day wrestling with a tough data set and a long computer queue. I have at least been assured that no one will have to type my ten-character last name to log in." "We are very excited about the Perlmutter system", stated NERSC Director Sudip Dosanjh. "It will provide a significant increase in capability for our users and a platform to continue transitioning our very broad workload to energy efficient architectures. The system is optimized for science, and we will collaborate with Cray, NVIDIA and AMD to ensure that Perlmutter meets the computational and data needs of our users. We are also launching a major power and cooling upgrade in Berkeley Lab's Shyh Wang Hall, home to NERSC, to prepare the facility for Perlmutter." 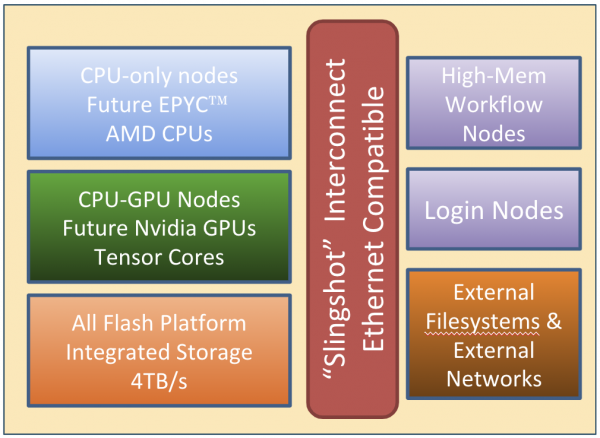 The new supercomputer will be a heterogeneous system comprising both CPU-only and GPU-accelerated cabinets. It will include a number of innovations designed to meet the diverse computational and data analysis needs of NERSC's user base and speed their scientific productivity. That includes a new Cray system interconnect, code-named Slingshot, that is designed for data-centric computing; as well as NVIDIA GPUs with new Tensor Core technology, direct liquid cooling, and an all-flash scratch filesystem which will move data at a rate of more than 4 terabytes/sec. "As a premier computing facility for the DOE, NERSC is driving scientific innovations that will help change the world, and we're honoured to partner with them in their efforts", stated Pete Ungaro, president and CEO of Cray. "We have collaborated very closely with the teams at Berkeley Lab to develop and implement our next-generation supercomputing and storage technology, which will enable a new era of access and flexibility in modelling, simulation, AI and analytics. We're looking forward to seeing the many scientific discoveries that result from the work done on Perlmutter." Located at Berkeley Lab, NERSC is the mission high performance computing facility for the DOE Office of Science, supporting more than 7000 scientists and 600 projects annually.